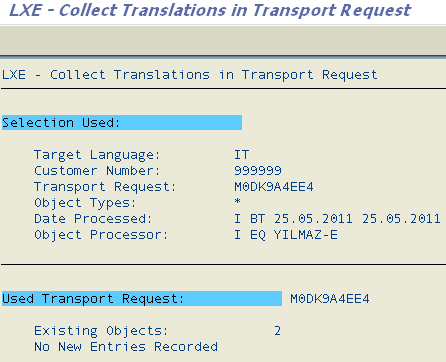 RS_LXE_RECORD_TORDER is a standard ABAP report which can be used to collect translations in transport request. ABAP developers can use RS_LXE_RECORD_TORDER ABAP program in order to transport text translations they created in different ABAP reports. After a workbench request is created including translations, it is possible for ABAP developers to release these text translations to other systems. If you want to use rs_lxe_record_torder transaction screen, the Transport Request number is mandatory. It is possible to automatically create transport request by using the "Create Request Automatically" checkbox. But it is better to create transport request manually using SE09 transaction code. Goto SE09 ABAP transaction code screen. Press "Create Request" icon or F6 short-cut in order to start creating workbench request. A task will also be created automatically. Do not forget to change the task type from Unclassified to Development/Correction task type. Copy the newly created but empty ABAP transport request number in "Transport Request" input area. 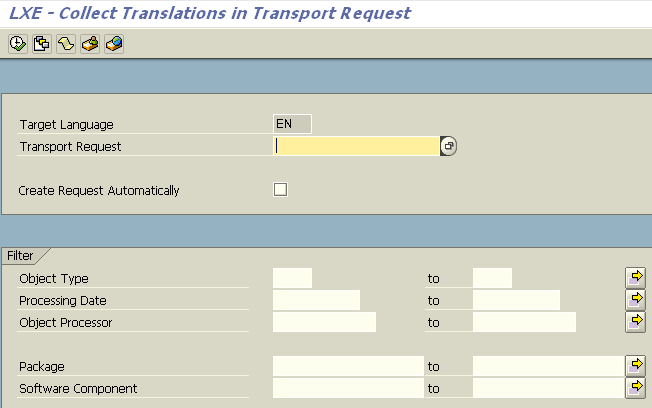 The most important point for creating transport request for text translations is choosing the target language. Here in this example, I used rs_lxe_record_torder screen in order to translate ABAP report selection texts into Italian. So the target language selection is IT. In order to minimize the transport request, ABAP developers can add their SAP user in the Object Processor filter and supply date for Processing Date criteria. When you go to SE09 SAP transaction, in workbench transport request, you will see the translations for the selected report texts and ABAP reports in the task details. ABAP developers can easily use rs_lxe_record_torder ABAP report for trasporting ABAP report translations from one SAP system to another.